Fading Shadow-1951 gray (bay base). Sired Fadl (r), Fay-Sabbah (r). Dark Is Fading-1956 gray (black base). Sired by Hallany Mistanny (r), out of Fading Shadow. 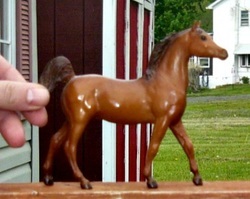 Briana-1965 flaxen liver chestnut. Sired by Pietuszok (r), out of Busznica (r). Bred by Celtic Song Stables and adopted from them. Imatoxicone-1969 flaxen chestnut sabino. Sired by Abu Farwa-r, out of Briana. Bred by Celtic Song Stables. Mishka-1971 bay rabicano. Sired by Elf-r, out of Massina-r. Bred by Celtic Song Stables. Currently a BSO. Will be a CM Sagr. Fatimah-1975 bay. Sired by Negatraz (r), out of Imatoxicone. Fading Light-1976 bay. Sired by Amrulla (r), out of Fading Shadow. 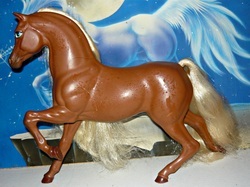 Copper Countess-1977 flaxen chestnut. Sired by Pharaoh, out of Gawdat. Bred with the help of Shadow Wolf Stables. 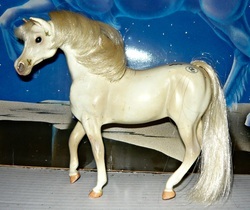 Frozen Dancer-1980 bay. 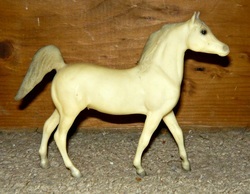 Sired by Fez-Raff-Stanny (r), out of Fatimah..
Desert Mysts-1981 gray (black or bay base). Sired by Esport (r), out of Maska (r). 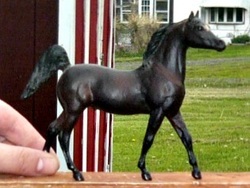 Bred by Shadow Wolf Stables and adopted from them. 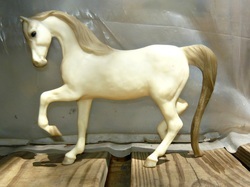 Spanish Elegance-1981 gray (chestnut base). Sired by Sid Brahim (r), out of Onza (r). Bred By Shadow Wolf Stables. 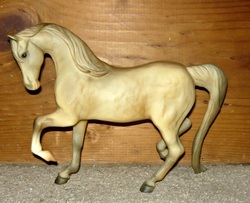 Fayth-1981 gray (bay base). Sired by Sukhaam, out of Sama'ah. Bred by WMHS. At least two lines to Nazeer, Egyptian line. 1988-Badieh Amira, gray filly (x Makhsous -r) o/b VnV Stables. 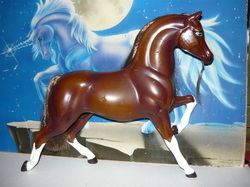 Darkening Moon-1981 gray (bay base). Sired by Grojor (r), out of Fading Light. 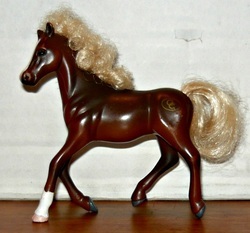 Lady Godiva-1984 flaxen chestnut. Sired by Muszak, out of CJ's Sorrel Lady. Bred by ? 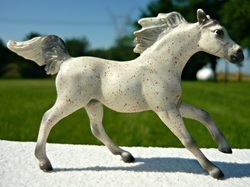 Silver Luna-1984 gray (chestnut base). 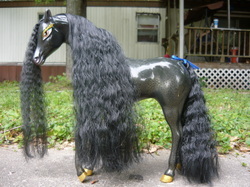 Sired by Arabesque Moon Magic-r, out of Precious-r. Straight CMK lined. 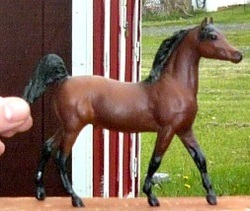 OF Kid Kore Arabian mare. 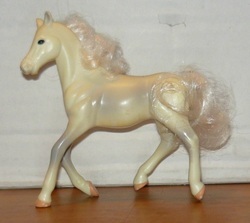 Lady Icickle-1984 gray (chestnut base). 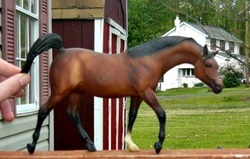 Sired by Arabesque Moon Magic-r, out of Twinoak Zahress-r. CMK and Babson breeding. Tolakha-1984 black rabicano/sabino. Sired by Tallin-r, out Lokhala-r.
Half Russian and half Babson. Bint Bezatal-1985 chestnut. Sired by Bezatal (r), out of Miya Mesaoud (r). 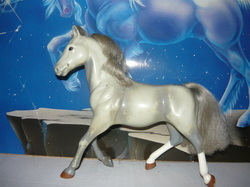 Faded Treasure-1986 gray (bay base). Sired by Dharas, out of Faded Fire. Bred by Shadow Wolf Stables. 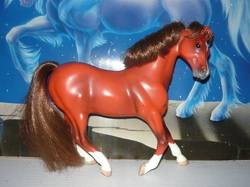 Mesmerize-1988 chestnut. Sired by Fascination, out of Lady Godiva. Bred by ? 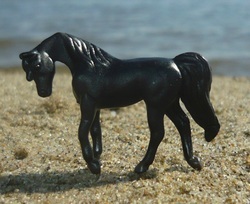 Kamas Nefertiti-1989 solid black. Sired by Kamars Sharif-r, out of Sba Chargalen-r. She is Straight Babson. 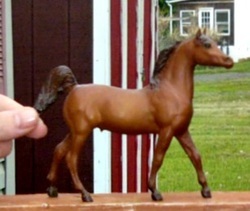 KSW Queen Nibbles-1990 flaxen liver chestnut. Sired by Amir El Shaklan-r, out of Rabfa-m. Bred by Legacy Farms. Fully retired from broodmare duties! 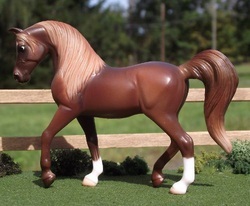 ​Anastasia-1991 flaxen chestnut. Sired by Samadinn, out of Anasatyra. Bred by Aspen Hill. 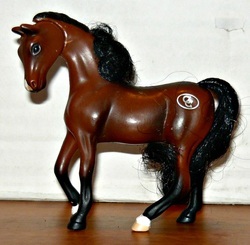 OF Breyer, Trad, PAM, Carinosa. 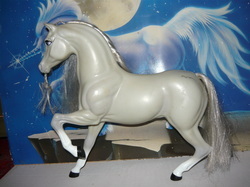 Renewed Mystrys-1993 rose gray (bay base). Sired by Lancir, out of NA Mystrys. Bred by Legacy Farms. Warrior Queen-1994 bay. 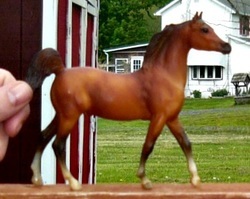 Sired by Sultan Ruler, out of Kamas Nefertiti. Despertara-1995 black. Sired by Desperado V (r), out of Mokhtara (r). 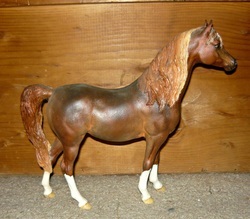 KSW Emerald-1995 liver chestnut sabino. Sired by The Roman, out of Ice Fire. Half Egyptian and half Davenport. Bred by Shadow Wolf Stables. Sire is owned by Legacy Farms. Anishka-1996 bay. 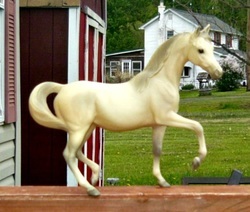 Sired by Tynishk, out of Anastasia. Acapella-1996 gray (red base). Sired by Sultan Ruler, out of KSW Queen Nibbles. 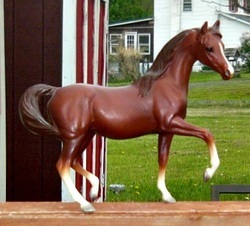 Rapture of Eclipse-1996 flaxen black liver chestnut. Sired by Eclipse of The Sun (r), out of Sun's Rapture. Bred by Celtic Song Stables. Akira-1997 gray (chestnut base). Sired by Heritage Bey King (r), out of Brandie Alexandra (r). 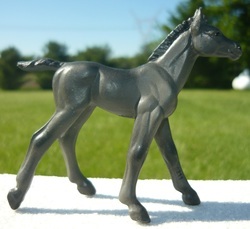 Crymera-1998 gray (black base). Sired by Eldon (r), out of Cyma (r). Straight Polish. Needs more sun time. Better pic to come later. The Black Widow-1998 black. Sired by Sultan Ruler, out of KSW Queen Nibbles. Pale Xiss-1998 gray (bay sabino base). Sired by Pale Vanity, out of Darxiss. Bred by Shadow Wolf Stables. ​Ruling Queen-1999 bay. Sired by Sultan Ruler, out of KSW Queen Nibbles. 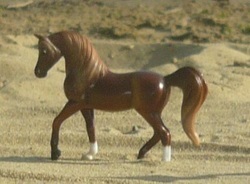 Desert Mystrys-1999 Gray (bay based). Sired by KSW Dune, out of Renewed Mystrys. Sire is Egyptian/Davenport and dam is Straight Polish. Zuna-1999 bay. Sired by KSW Dune, out of Zoraida. Bred with the help of Celtic Song Stables. 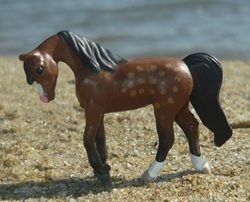 Apollos Eclipse-2000 flaxen black liver chestnut sabino. Sired by Grand Apollo, out of Rapture Of Eclipse. Possible Straight Crabbet. Bred with the help of Legacy Farms. 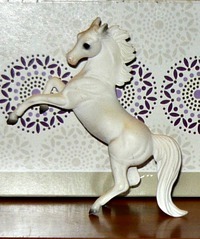 Sultan's Charmer-2000 gray (chestnut base). Sired by Sultan Ruler, out of KSW Emerald. 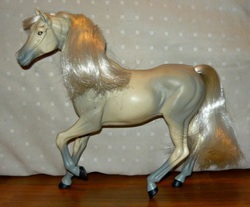 Lady Druid-2000 gray (bay based). Sired by Pepton-r, out of Druzja-r. Straight Polish. Imperial Gem-2000 flea bitten gray (bay base). Sired by Sultan Ruler, out of Renewed Mystrys. Pic done by Tracey Bartone. Like A Love Song-2000 black. Sired by Ru Amir Bah, out of Nadira Bint Aleesha. Bred By Indigo Creek Stables. She is of old Egyptian lines, half Babson (sire) and half Brown (dam). Non Nazeer! Custom done by Bethany Shaw. Myka-2001 chestnut rabicano and sabino. Sired by Kubinex (r), out of Tolakha. Winter White-2001 gray (black base). Sired by Sultan Ruler, out of KSW Queen Nibbles. Miytara-2001 black sabino. Sired by TC Miyake (r), out of Despertara. Imperial Bey-2001 rose dapple gray (bay base). Sired by Sultan Ruler, out of Renewed Mystrys. She has Russian and Polish lines. Sultana-2002 bay. Sired by Sultan Ruler, out of KSW Queen Nibbles. Seen A Ghost-2002 bay Dominant white. Sired by R Khasper (r), out of Kamas Nefertiti. Half Babson lined. Sire is founder of W3 dominant white line in Arabians. 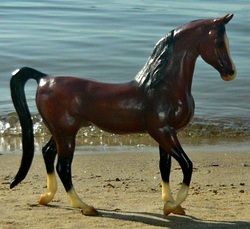 Hidden Oasis-2003 Dapple bay sabino. Sired by Thee Infidel-r out of Hr Tali Tiflah-r. She is straight Egyptian and is Babson on her dam's side. She can only be bred to Grand Polaris for foals. Harem Girl-2003 dark bay. Sired by Sultan Ruler, out of KSW Queen Nibbles. 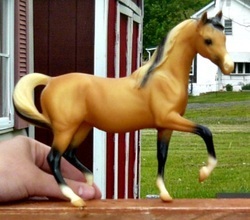 Askja-2003 flaxen chestnut sabino. Sired by Amir El Shaklan (r), out of Rabfa. Bred by Legacy Farms. Full sister to KSW Queen Nibbles. 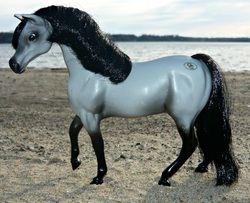 Basha-2003 gray (black base). Sired by Gaudi, out of MS Bermuda. Straight Polish. Bred by Shadow Wolf Stables. Layali-2004 bay. Sired by Sahlih (r), out of Shems. Bred by Gubbera Park. 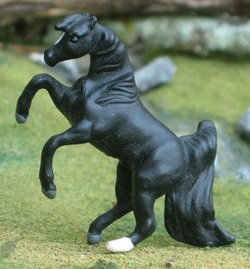 Eternal Queen-2004 gray (black base). Sired by Eternal Paradox, out of Zuna. Princess Royale-2004 gray (bay base). Sired by Sultan Ruler, out of KSW Queen Nibbles. 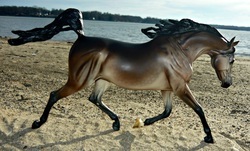 Southwind Dancer-2004 bay. Sired by Sultan Ruler, out of Desert Mystrys. 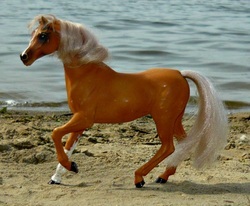 Blue Diamond-2004 flaxen chestnut sabino. Sired by Fc Casino Royale-r, out of Eliron Euphoria-r.
2013-SA Smokin Aces, black sabino colt (x Grand Polaris) o/b Ariel Williamson. 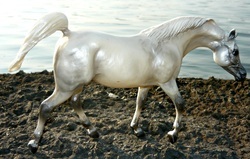 LA Basken Jewel-2004 gray (bay base). Sired by Heritage Bey King (r), out of Wisel (r). Primarily of Polish breeding, not sure if straight Polish. 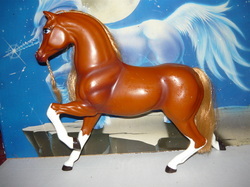 Regal Queen-2005 chestnut. Sired by Sultan Ruler, out of KSW Queen Nibbles. Darq Myst-2005 gray (black base). Sired by Darq Justice, out of Desert Mysts. Bred by Shadow Wolf Stables. 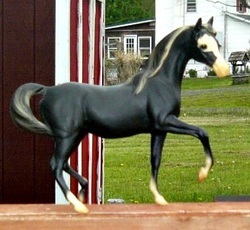 2010-Darkq Prowler, black colt (x Prowidenz -r) o/b Spur Star Ranch. 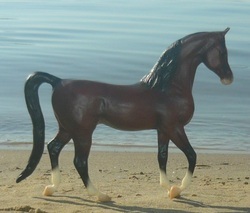 Snowbound Legacy-2005 black rabicano/sabino. Sired by Grand Legacy, out of Serenity Bint Hisan. Bred by Legacy Farms. Half Crabbet and half Egyptian. Royal Dancer-2006 chestnut. Sired by Sultan Ruler, out of KSW Queen Nibbles. 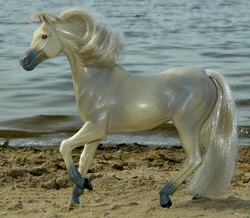 Azshara-2006 gray (chestnut based). Sired by Set, out of Boeotia. Bred with the help of Ali Dunning. ​Elemental Temptation-2006 flaxen chestnut rabicano/sabino. Sired by AMB Elemental Phoenix, out of Temptations. Bred by Shadow Wolf Stables. Celestial Nebula-2007 black rabicano/sabino. Sired by Grand Legacy, out of Serenity Bint Hisan. Bred by Legacy Farms. Half Crabbet and half Egyptian. Pagan Storm-2007 Bay rabicano/sabino. Sired by Darkness Reigns-bso out of Darxiss-bso. Bred by Shadow Wolf Stables. Customized by Cassandra Knipp and photo by her as well. Not open for the public. Photo show champion. Many times over. Customised by Heather Kapica of Legacy Studios. Photo by Heather Kapica as well. 2016-Reserved to Rose To The Challenge (o/b Pied Piper Ranch) for NSH foal. 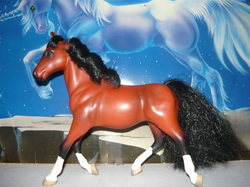 Emprezz Fire-2009 rose dapple gray (chestnut base). Sired by Winter Fire, out of *Emprezza. Bred byBeau Monde Stables. 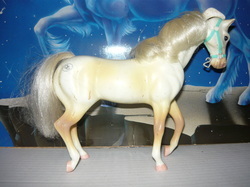 Lunar Wind-2009 bay. Sired by Lunar Goldn Silver, out of Southwind Dancer. Tolarah-2009 black rabicano and sabino. Sired by Grand Polaris, out of Tolakha. Homo for rabicano and sabino. Also homo for black. Seenapolarhotspot-2009 black DW rabicano and sabino. Sired by Grand Polaris, out of Seen A Ghost. 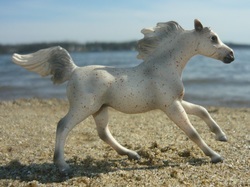 Desert Dreamer-2009 Sooty dapple bay sabino. Sired by Grand Polaris, out of Hidden Oasis. 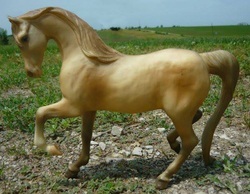 Lady Katrina-2009 Flaxen Chestnut. Sired by Talietzin, out of Royal Amber. Bred by Legacy Farms. Straight Russian. Pic credit goes to Tracey Bartone of Shadow Wolf Stables. 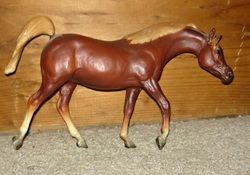 The Red Halestorm-2009 flaxen liver chestnut. Sired by Talietzin, out of Peace Storm. 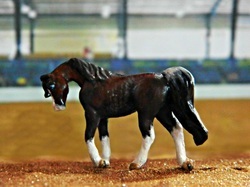 Bred by Pied Piper Ranch. Half Russian and half Polish. My Lady-2010 chestnut. Sired by Sultan Ruler, out of KSW Queen Nibbles. Diamond Soul-2010 chestnut. Sired by Sultan Ruler, out of Blue Diamond. Born To Rule-2011 black. Sired by Sultan Ruler, out of KSW Queen Nibbles. OF Best Talking Horses, Arabian foal. KSW Kamira-2011 gray (black base). Sired by Grand Polaris, and out of Dhar Ghazalah (r). 3/4 Egyptian (half of that Babson) and 1/4 Crabbet. OF Grand Champion Blue Ribbon Offer, Kamira. 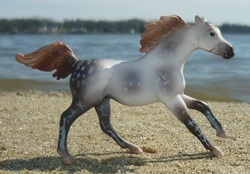 Celestial Pebbles-2012 Liver chestnut sabino. Sired by Grand Polaris, out of KWS Queen Nibbles. 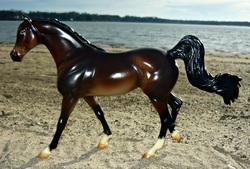 Hott Desyres-2012 black sabino. Sired by Grand Polaris, out of Red Hott. 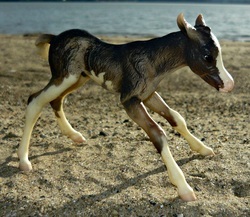 Shown as a young foal. She is Grand Vengeance's only full sibling. Bred by Legacy Farms but owned by me. Both her sire and dam are single carriers of rabicano and single carriers of sabino. Desi only got one sabino and no rabicano. Shame really but she's still a cute little mare. Very glad to have her as part of the herd and soon enough to be part of the mare band. As of right now it looks like she will not be open for the public but will only be used privately by me as her dam was exported to Germany earlier in 2013. Tweaked Storm-2012 bay rabicano/sabino. Sired by Tweaked Out Shoshann, out of Pagan Storm. 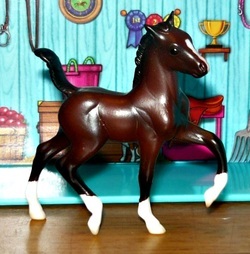 Sire is owned by Pied Piper Ranch. Nahwari-2013 chestnut. Sired by SMS Anwar, out of SMS Bint Nahmeh. Bred by Silver-Moon Studfarm, IT. 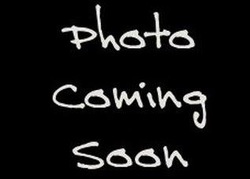 Exotic Legacy-2013 flaxen chestnut sabino. Sired by Rendevous, out of Snowbound Legacy. Sire is Spanish and dam is Crabbet/Egyptian. Escape The Nyte-2013 solid black. Sired by Sr Faaris Faaris-r, out of Kamas Nefertiti. I believe this is a Safari model but don't count me on it. OF of course. KSW Lightsaber-2013 chestnut rabicano/sabino. Sired by Sith Master, out of Al Wajbah Al Shaqab-r. Currently a BSO. 1/4 Russian, 1/4 Babson and 1/2 Egyptian (Nazeer) Has 14 crossings to Nazeer, 13 of those being on her dam side. Cannot be bred ot any horse that carries Nazeer. Zaysi-2014 chestnut. Sired by SMS Zubary, out of SMS Maysaa. Bred by Silver-Moon Studfarm, IT. My Obsession-2014 flaxen black liver chestnut rabicano & sabino. Sired by Grand Vengeance, out of Rapture Of Eclipse. Vengful Ghost-2014 bay DW rabicano and sabino. Sired by Grand Vengeance, out of Seen A Ghost. Elemental Legacy-2015 chestnut rabicano and sabino. Sired by AMB Elemental Phoenix, out of Snowbound Legacy. 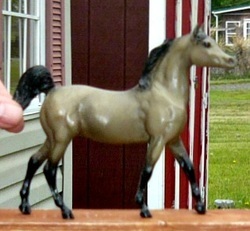 Bred with the help of Shadow Wolf Stables. Polar Vortex-2016 bay rabicano and sabino. Sired by Grand Polaris, out of Hidden Oasis. 3/4 Egyptian ((1/4 of that Babson) and 1/4 Crabbet. Currently a BSO but hoping to get a CM WG to fill this. SmokinHott Desyre-2016 chestnut. Sired by Regained Dzyre, out of Hott Desyres. Bred with the help of Shadow Wolf Stables. Desert Light-2017 bay. Sired by Grand Polaris, out of Hidden Oasis. 3/4 Egyptian (1/4 of that is Babson) and 1/4 Crabbet. Vampyra Desyres-2017 black. Sired by Treff Haven Azrak (r), out of Hott Desyres. 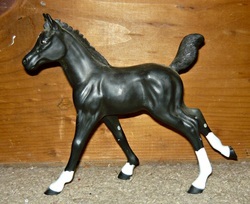 OF Breyer WG Rhapsody In Black.